We greet people we know and people we don’t know. Doctor Aka stops and gives extended greetings to the hoary-headed men sitting along the way. Aya and I dip into a little store to buy bread and sweets. It wouldn’t do to arrive at the joy empty-handed. It’s the tail end of my 7-month stint of teaching English in an Uzbek village and I’m strolling down the dirt roads with my host parents—the rollicking Doctor Aka and nurturing Aya. We draw close to a relative’s house, Shakhnoza Sister’s, whose children we love. “Let’s see the baby. Can’t just go by without seeing the little Kyrgyz,” laughs the Doctor. It’s his personal joke to call the almond-eyed baby a Kyrgyz. We halloo the house and let ourselves into their courtyard. Shahnoza Sister’s mother-in-law rises from the sitting on the avon—a raised wooden sitting platform—and rushes about to set out sitting mats and a table cloth, despite our protests that we can’t stay for tea, that we only stopped by to see baby Madina. Shakhnoza Sister brings her out for Doctor Aka to grab. Madina beams chubby-cheeked smiles at all our adoring attention. We then continue on to our joy. There are endless occasions to throw party in this village. Birthdays, weddings, the purchase of a car, a holiday—all call for throwing a party. The occasion this evening is the return of a relative and his wife from working in Russia. Ayah and I join the women in their separate place. All the aunts are present. 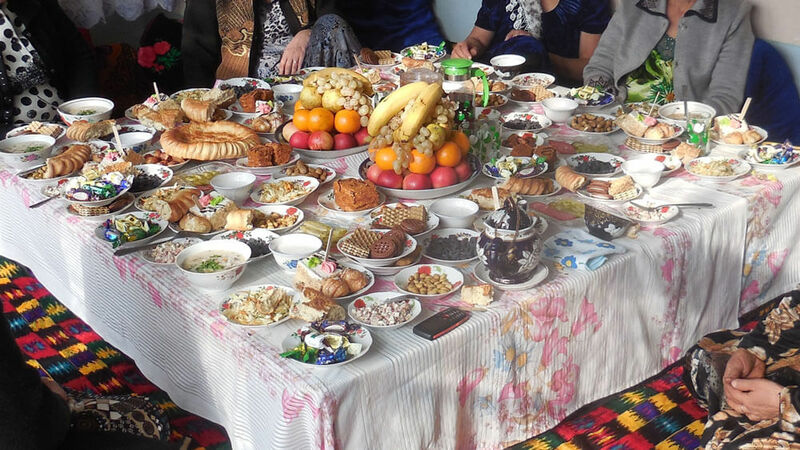 We nibble on Russian chocolate, drink green tea, tell stories, delve into osh—the signature rice dish of Central Asia. My departure in a few weeks is now a main topic: We are planning to have a good-bye party, to cry, to keep in touch by Skype, and for me to invite them to my wedding (which they all pray speedily comes to pass!). Seven months ago I didn’t know these people or their language. I didn’t know that I would visit from place to place and find them just that: joys.